A direct result of our Bonsai Workshops and an amazingly popular item with customers of ALL ages - a simple introduction to the fascinating world of Bonsai AT ONLY $25.00! Now this really IS a lot of fun. THE PERFECT CLASSROOM PROJECT... Teachers, please contact us for special Education packages. (Take a look at Our Bonsai Palace Practical Notes too!). 2. Bonsai trained young tree suitable for potting at this time of the year. 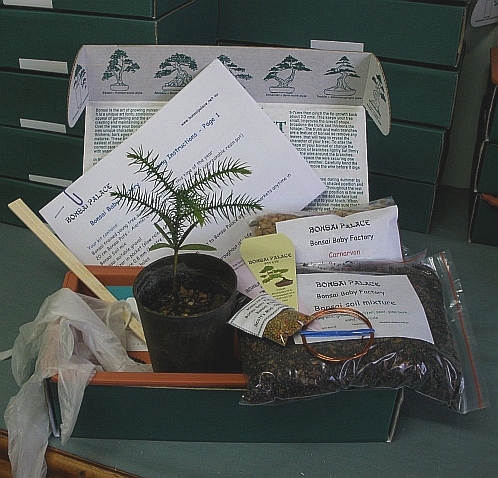 You can choose your tree from a tray of young trees (for shipping to WA outer metro cities and towns, we swap the tree for suitable seeds). 4. Bonsai Soil mix in quantity to suit 20 cm Aiermei pot. 5. Gravel in bag . 6. Mini osmocote fertilizer in packet (20 g in plastic bag). 7. Copper wire 0.8 mm (1 metre length). 8. Mesh for pot holes . 10. One pair of rubber gloves. 11. Instructions on how to make a Bonsai. 12. Instructions on how to care for a Bonsai throughout it's life. 13. Plant tag for the Bonsai ID. 14. Plant tag for a FREE 'feed and groom'. For a visit to Bonsai Palace at Palmyra Farmers Market anytime in the next 3 months. 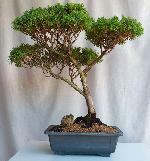 These checkups are free to all our customers who purchase or create bonsai with us. 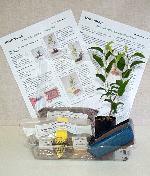 As you can see, the Bonsai Baby Factory is a complete package containing all you need to get started, including extensive assembly and MicroBonsai care instructions. Please ask us about bulk shipments and special packages for Educational use.